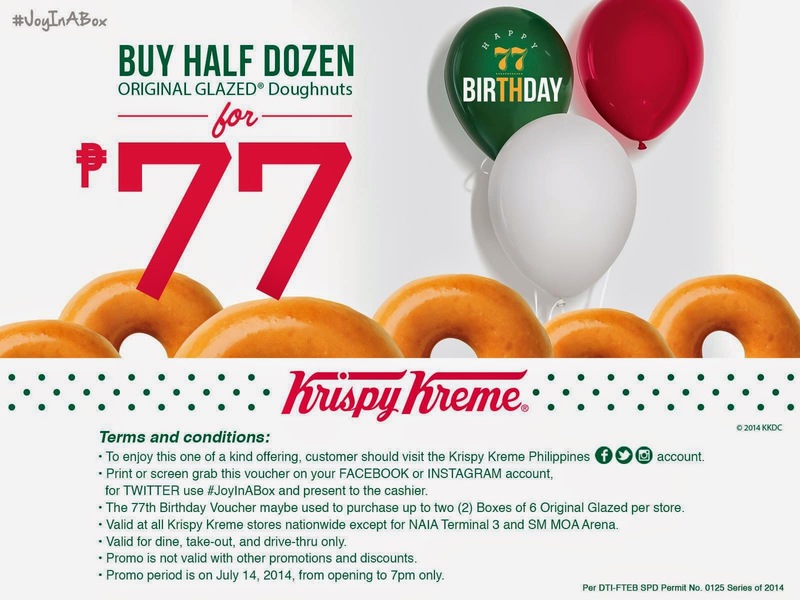 Celebrating 77 years of adding sweetness to our everyday Krispy Kreme launches it's latest offer. A box of half dozen Original Glazed at only Php77! All you have to do is print or screen grab this voucher on your Facebook or Instagram account. For Twitter, use #JoyInABox and present to the cashier. Valid for two (2) boxes per fan at all stores nationwide except at these kiosks NAIA Terminal 3, SM MOA Arena, SM Marilao, SM Taytay, SM Marikina, BF Resorts, The Block, Harbour Point, Sta Lucia, Robinson's Place Forum, SM Sucat, SM Annex Fairvew and BHS Cinema. Share this to our friends now!